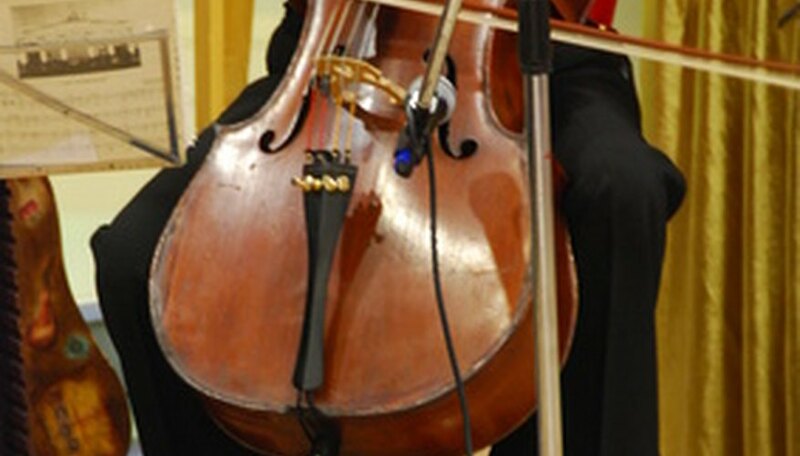 The cello is an orchestral instrument that is a member of the string family. This instrument resembles a violin but produces much lower tones than a violin. The cello can be plucked or bowed. The strings of the cello are tuned to C, G, D and A from left to right if you are facing the instrument. The thickest string is the first string on the left, which produces the lowest note (C). The thinnest string is the one to the far right, which produces the highest pitch (A). The cello situates itself within the string family of instruments as the second largest instrument. The largest stringed instrument in the orchestra is the double bass. The violin is the smallest, and the viola is bigger than the violin but smaller than the cello. You can produce tones on the cello by either plucking the strings or bowing them. Plucking is a technique known as "pizzicato," and it produces short, choppy sounds. Bowing creates a smoother, more fluid sound. You play the cello while seated. You situate the cello on the floor, in between your legs. The strings of the instrument face outward as you play. Most cellists pluck or bow with their right hands and hold the strings down on the neck to change notes with their left hands. You can play different notes on the cello by playing the different strings and by holding the strings down in various locations on the neck. The closer to the body of the cello that you hold down a string, the higher the pitch will be. What Are the Notes on a Violin?